One of the best links provided to SL residents is the "Destinations Guide". If you open your Destination Guide and look on the left side of the screen you will find categories. I usually explore a couple listed under "recently added" [near the top]. This week I visited several stops under the category "Strange & Mysterious". This category appears near the bottom of this lengthy list. I visited these sites six months ago, and visiting them again was quite interesting. Most Confusing is Jack the Ripper and Jack the Ripper. Two distinct and different locations. The one currently promoted in the destinations guide is very nice build of London in the late 1800s that is one single block. Super creepy, dark and changes in weather. While visiting you would realize you are along one of SL’s many land routes. The asylum is not part of the real Jack the Ripper. It is a very nice niche made here in this block for visitors. Take a lot of pictures, this could make a good Halloween texture to send out. The parcel I am more familiar with is titled “1888”. It is on Timerry Island and has existed a couple of years now. This a full RP city set in late 1800s. Landing in this city the owner provides period clothes for those who are OCC. There is a club called “Club 88”. If you want to RP late 1800s and naughty, start at the club. I am not sure what all the naughty is on this parcel. I did stumble onto a place with freebie pony play items. Of course, I picked them up. I wanted to see what they were…let’s say I am giving a big pass on pony play. Creepiest city goes to Inns mouth. You can see the love of building that was put into this Love craft built. There are interesting things to see in most of the buildings. Some are run down homes. There is an old bookstore with a back-room card game. The cards are flying around the room. My favorite spot is the theater. It runs a silent film clip and cycles it. Super creepy, super fun, this will keep you busy exploring for quite a while. I mounted up and rode my horse around town. The sounds of my horse on the dark streets was eerie. I wanted the horse for a fast get away. Dives or every day places, are popular builds to make scary. One of those is the DoX Motel. This is location is in the Pacific northwest. All the rooms are occupied by unknown people. I recommend adjusting your sun to midnight for maximum strange effect. I entered each room, most were disheveled and messy. Remnants of occupants were left behind. Downstairs the office is unattended. the DoX has an isolated feeling. I would not have been surprised to have someone jump from the shadows. Plan to stop for only a short time at this parcel. 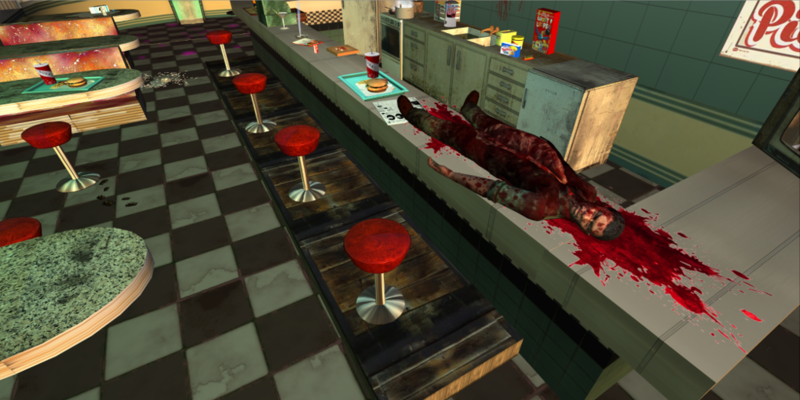 Olivia's Diner is another dive. There is no mistaking the strangeness of this stop. For one thing there are a couple of murder scene poses in the front lawn. They are funny and chilling. Inside there is a body on the counter who has been gutted. There are rats and roaches, roaches on the floor, rats on the counter. There is a Colonel Sanders style bucket with human heads inside. There is an ongoing Horror Trivia. I won 15L, 1L a question. This parcel has imagination and care put into the disturbing build. I will be visiting again soon to figure out what the buck deer on the lawn is doing while standing on the lawn. There are even two dance floors, one inside by the rats and one outside by the crime scenes. Love it! Olivia’s wins my vote for more disturbing and spine chilling. Dystopia is “in” for builders. I've seen this theme repeated a few times, each time I have been able to see the care and imagination of the builder. There are fourdystopian stops I recommend for this type of Strange & Mysterious. The first two are on the guide. 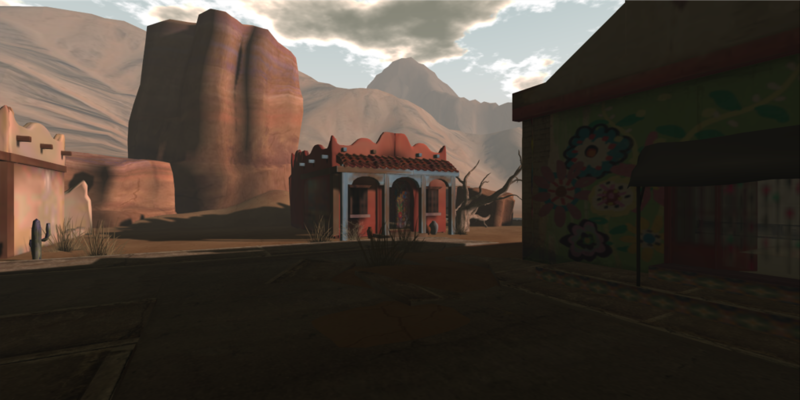 Tableau is a post-apocalyptic desert area. I took my horse there and rode around the desert. It is desolate, it is lonely. The land seems to go on forever. It looks like a time from Mad Max movies. 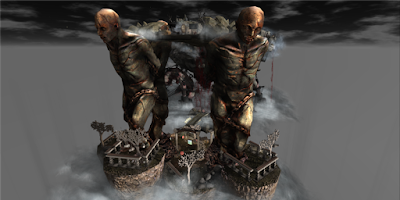 Another stop on the Destination guide that is good is titled Dystopia. The landing point for this build is off so I have given you a better one below. Dystopia has a city block open to all as well as an area for group members. Most buildings are abandoned and that is the overall feeling I had walking through the build. World's End Café is featured this week in the Destination Guide. This is not in the Strange &Mysterious. I would add this strange location. Just a building at the end of a dock. Hypnotic odd and strange capture how I would rate it. I would recommend adding a trip to the Nuclear museum if you are dystopia hopping. I love the Citta Perdu [the lost city]. I started visiting this site several months ago when it was snowing there in the city. I asked the builder what the city represented. She told me it is a city where one day everyone just left. No war or dystopia, just gone. To add to the thrill of this city go through the sewers. There is a hidden bar within them. Look at the subway. There is much to be seen in this lost city. When I first began traveling to this location, there were northern lights in the backgrounds. Pack your camera and take a friend, this build is a treat. I was introduced to the Verdigris sim by a friend some time ago. On the surface it is impressive. On my first trip there, I saw a few areas and thought it was a nice place. Later I visited and began combing the buildings and other areas. 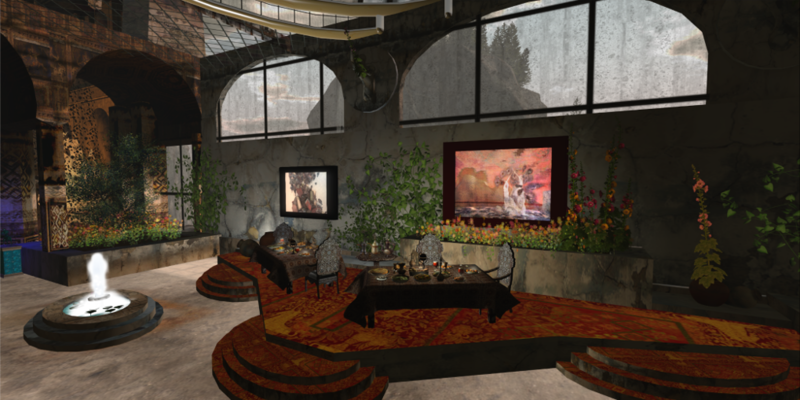 Some of the areas to explore are the Rossell Hope Robbins sLibrary, the Expedition Hall and the Clockwork Bird. Like the Lost City, this stop has much more below the surface than you may anticipate. There is a mini city that falls victim to a tidal wave within the walls of Verdigris. There is a man thinking about jumping into the water below. He has been considering this for months now. What will you find in Verdigris? Temple of Iris is on the strange & mysterious Destination Guide list. It is neither strange nor mysterious. It is a historic SL location. If I were to make a list of "must see" locations for SL, the Temple would be on the list. For those who build, look at that prim count. Ouch! The total prims on this build is huge and scary. 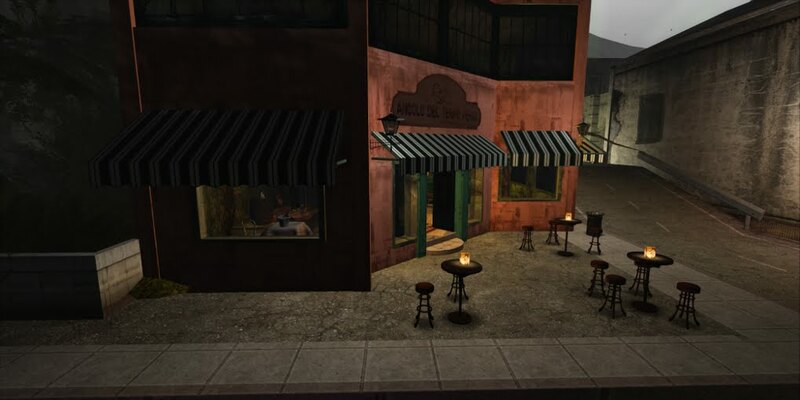 Stop by take your picture and visit some authentic SL history. I saved the most unusual for last. It is called "untitled". This stop is on part of the LEA sim. LEA builds only remain active for set period. This build is one to cam up and out to see from a distance, then cam in and look at the details. Waterfall of blood, shallow pool of blood are parts of this build. You may move around using a mirror teleport which I believe is quite clever. It is necessary to take your camera out, very far out to view the entire build. There are two bronze men carrying the “burden” of the project. Each man is standing in a corithen columned square. Bring your camera back in and visit all the sites you are able to visit. This build is temporary.